Despite today being my birthday, while we were out shopping we bought Addi a present. Something I have been wanting to get him for sometime now is a musical mobile. I couldn’t believe his reaction to it when he saw it for the first time… totally mesmerised!! I don’t know too much about other musical mobiles but this one has me very impressed. It has some really cool features that made it stand out from the others when trying to pick at the shops. The mobile we decided to buy is the Fisher Price Rainforest Dreams Mobile with Remote (please note there are a couple different versions of the Fisher Price Rainforest Mobiles). The toys on this mobile are not only very cute but are bright, which is great for a baby’s development. The toys rotate slowly while the music plays. There are 6 different tunes that play and have two sound volume settings, perfect for either night or day. It also has patterned light effects that shine onto the ceiling at night time. It has the option to isolate each feature as well, so if you don’t want sound and just want the toys to rotate, that’s possible. Likewise you can turn the light feature off during the day. 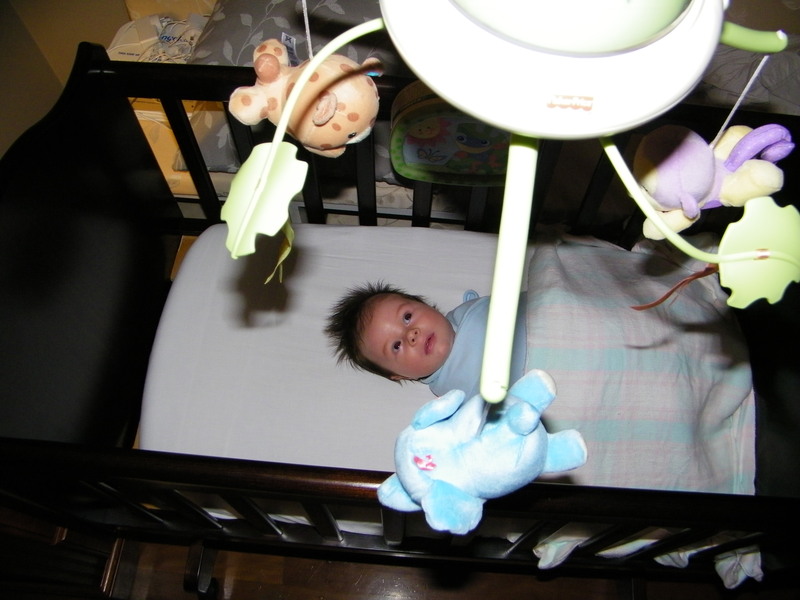 The mobile is easily attached to a cot and can be moved whenever you like. Plus it also has a remote control which is very handy for night time use to turn the mobile off and on from bed. It is battery operated, which not all mobiles are. At $50.00 it really was the most reasonable and feature packed musical mobile I could find. Charles thought it would be funny to take a photo of me while I was trying to film Addi looking up at his new mobile…so I thought I would share it too.